Loyal to the great tradition of an “art de vivre” nearly forgotten elsewhere, the Hotel du Palais combines luxury with the understated elegance of rare, privileged moments. Perched regally on Biarritz’s wide, sandy beach, one hundred yards from the town’s center, the Hotel du Palais is a two-minute walk from the Casino. 3000 square meters or 5 floors of cocooning in a unique space dedicated to your plenitude. The “Californian” pool is ideally situated by the Grande Plage and seems like a natural extension of the Atlantic Ocean, only private. Pool water is drawn directly from the Ocean and is heated to 27°Celsius year round. The solarium’s perfect exposure, with sun all day long, is a privileged observation point to watch magnificent Biarritz sunsets. The pool is open from April to September for your leisure activities and exercise with two 33-meter swimming lanes. A pitch and putt green with bunker and putting green are at your disposal year round to practice facing the ocean before taking on one of the 11 splendid 18-hole courses of the Basque Coast. Outdoor children’s games will delight and occupy your angels for hours. A designated children’s pool is available to entertain the younger generation of Palais guests. For those businessmen who absolutely must work, a business centre is at their permanent disposal with computers, Internet access, photocopier, scanner and secretarial services. General Assemblies, conferences, international summits, perfume launches, automobile shows, incentive meetings for your most meritous collaborators, the Hôtel du Palais’ Group Events department is renowned for its flexibility and creativity. Our La Rotonde restaurant may also be privatized to accomodate up to 500 people for a cocktail reception or up to 300 people for a buffet diner. Our classique rooms overlook the Palais gardens, the Cour d’Honneur, or the pool and beaches, and combine refined decor with every modern amenity. The 27 square meter rooms are furnished in Second Empire style. Free Wireless connection,Cable Internet access, air conditioning, an LCD flat screen with interactive television, two daily maid service, comfy bathrobes, 24-hour room service, and mini-bar. Connecting rooms and suites are available upon request. Our Prestige rooms overlook the Palais gardens, the prestigious Cour d’Honneur or directly onto the Atlantic Ocean, combining spaciousness and refined decor with every modern amenity. Rooms measure approximately 35 square meters and are furnished in Second Empire style or, for those on the 5th floor, in a clipper ship style. Free Wireless access, Cable Internet access, air conditioning, an LCD flat screen with interactive television, two daily maid service, comfy bathrobes, 24-hour room service, and mini-bar. Epitomising the tradition of remarkable ‘Grand Siècle’ decor, they each have the most modern technological and communication equipment: giant LCD interactive televisions, CD player, high-speed Internet and free wireless access in each room. Their refined, nobly elegant style incarnates French luxury. Burmese teak, Carrara marble and Italian glass mosaics are just a few of the noble and precious materials used in these suites. Our Royale Suites can be made up of one, two or even three bedrooms connecting with the living room. all feature the most sophisticated audio-visual equipment such as giant LCD screens and high-speed Internet and wireless access. Our vast Imperial Suites (between 60 and 75 square meters) open onto the endless ocean. The bathroom is an oasis of well-being, adorned in Carrara marble. Our Imperial Suites can be made up of one, two or even three bedrooms connecting with the living room. all offer a separate sitting room, allowing you to entertain friends privately. They measure between 50 and 65 square meters. 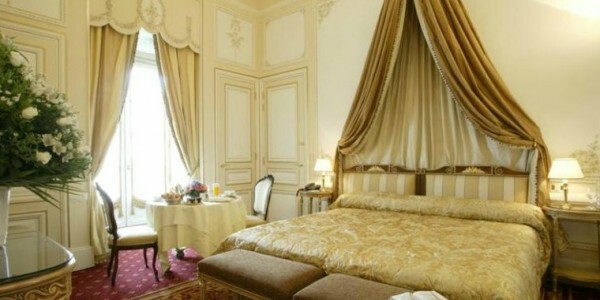 The Cour d’Honneur suites are approximately 60 square meters and have a parlour. All our suites are decorated in the purest Second Empire tradition with carefully chosen furniture and fabrics. They feature the latest audio-visual equipment such as LCD screens, high-speed Internet and free wireless access and work area. The suites are named for those important people who have honoured us with their presence or work: Gary Cooper Suite, King Farouk Suite, Edmond Rostand Suite and Prosper Mérimée Suite. A privileged, festive banquet spot to savour the refined cuisine of Jean-Marie Gautier and his team, served by very attentive staff. La Rotonde harkens back to the great receptions of the Belle Epoque era. The crowned heads of Europe never missed balls, gala dinners or other engagements, which defined the thrilling Biarritz nights. The restaurant (one star in the Michelin Guide), which reflects the exceptional quality of the premises, proposes rich and savoury cuisine, where Jean-Marie Gautier and his team pay tribute to local seafood and regional produce. 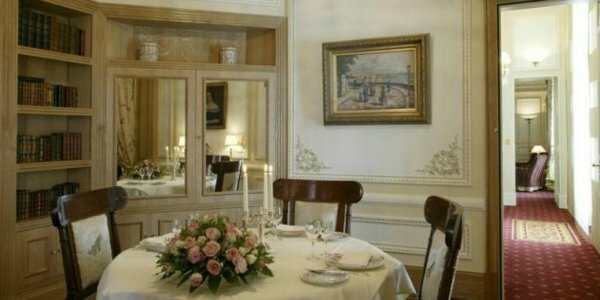 Specialities include sea bass with a Domaine Brana white wine cream or sautéed mullet filets, baby cuttlefish and creamy rice in an Espelette pepper and squid ink sauce, all served in a cosy atmosphere where stupendous chandeliers illuminate white walls with gilded mouldings. The summer restaurant Hippocampe features one of the most beautiful views of Biarritz. A prize-winning range of novel cocktails for a hearty start to the evening. A lovely selection of Armagnacs and Cognacs for a cosy nightcap with friends. Our guests, if so inspired, are welcome to join the musicians for a jam session in a jazz-imbued atmosphere! Our barmen will guide your drink choices and lend a friendly ear to your innermost thoughts. Come relax in this quiet lounge to read the day’s papers or peacefully leaf through your favourite magazines. Enjoy an herbal tea or energy drink to suit your mood.